When you use the macro recorder to generate the code for creating a PivotTable programmatically, Excel uses the Add method of the PivotCaches collection to create a new PivotCache. A PivotCache object represents the data behind a PivotTable. It is an area in memory where data is stored and accessed as required from a data source. 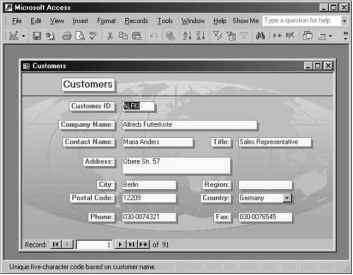 The example procedure connects to the Microsoft Access Northwind database using the MicrosoftJet.OLEDB.4.0 provider. To use this type of connection, you must set up a reference to the Microsoft ActiveX Data Objects (ADO) in the References dialog box (available in the Microsoft Excel Visual Basic Editor screen). Once the skeleton of the PivotTable is created, the code adds appropriate fields to the PivotTable. You should use the PivotCache when you need to generate multiple PivotTables from the same data source. By using a PivotCache, you can gain a high level of control over your external data source. The PivotCache object can also be used to change and refresh data stored in the cache. The last several lines of the example procedure demonstrate how to find out information about the PivotCache. 1. Add a new module to the current workbook and enter the following procedure code. 2. Run the procedure to generate the PivotTable.
' Obtain information about PivotCache With ActiveSheet.PivotTables("Invoices").PivotCache Debug.Print "Information about the PivotCache:" Debug.Print "Number of Records: " & .RecordCount Debug.Print "Data was last refreshed on: " & .RefreshDate Debug.Print "Data was last refreshed by: " & .RefreshName Debug.Print "Memory used by PivotCache: " & .MemoryUsed & _ " (bytes)"